Biofilm-associated infections constitute a daunting threat to human health, since these pathologies increase patient mortality and morbidity, resulting in prolonged hospitalization periods and heavy economic losses. Moreover, these infections contribute to the increasing emergence and dissemination of antibiotic resistance in hospitals and in the community. Although biofilm-associated microorganisms can proliferate in healthy tissue, abiotic surfaces like those of medical implants greatly increase the likelihood of biofilm formation in the host. Due to their broad spectrum of bactericidal activity against multi-drug resistant microorganisms including metabolically inactive cells, antimicrobial peptides (AMPs) have great potential as anti-biofilm agents. In fact, a clinically available AMP, polymyxin E (colistin), frequently constitutes the drug of last recourse in biofilm-associated infections (e.g. cystic fibrosis) when resistance to all the other drugs arises. In this article, we outline the main strategies under development to combat biofilm-associated infections with an emphasis in the prevention of microbial colonization of medical implants. These approaches include the use of AMPs both for the development of anti-adhesive surface coatings and to kill biofilm-forming cells either on contact or via controlled release (leaching surfaces). Although in vitro results for all these applications are very encouraging, further research is needed to improve the anti-biofilm activity of these coatings in vivo. The possibility of exploiting the antibiotic potentiating activity of some AMPs and to combine several anti-biofilm mechanisms in tandem targeting the biofilm formation process at different stages is also discussed. Keywords: Biofilm, Antimicrobial peptides, Biomaterial, Surface-functionalization, Medical-implant, Infection. Affiliation:Department of Microbiology and Parasitology, University of Navarra, 31008 Pamplona, Spain. 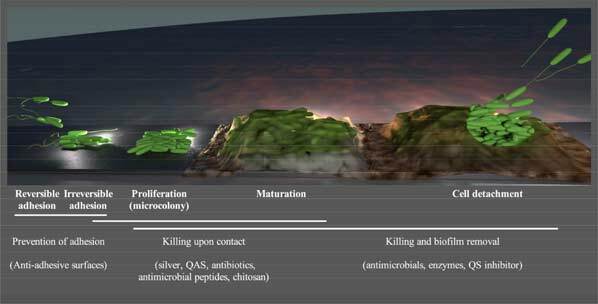 Keywords:Biofilm, Antimicrobial peptides, Biomaterial, Surface-functionalization, Medical-implant, Infection. Abstract:Biofilm-associated infections constitute a daunting threat to human health, since these pathologies increase patient mortality and morbidity, resulting in prolonged hospitalization periods and heavy economic losses. Moreover, these infections contribute to the increasing emergence and dissemination of antibiotic resistance in hospitals and in the community. Although biofilm-associated microorganisms can proliferate in healthy tissue, abiotic surfaces like those of medical implants greatly increase the likelihood of biofilm formation in the host. Due to their broad spectrum of bactericidal activity against multi-drug resistant microorganisms including metabolically inactive cells, antimicrobial peptides (AMPs) have great potential as anti-biofilm agents. In fact, a clinically available AMP, polymyxin E (colistin), frequently constitutes the drug of last recourse in biofilm-associated infections (e.g. cystic fibrosis) when resistance to all the other drugs arises. In this article, we outline the main strategies under development to combat biofilm-associated infections with an emphasis in the prevention of microbial colonization of medical implants. These approaches include the use of AMPs both for the development of anti-adhesive surface coatings and to kill biofilm-forming cells either on contact or via controlled release (leaching surfaces). Although in vitro results for all these applications are very encouraging, further research is needed to improve the anti-biofilm activity of these coatings in vivo. The possibility of exploiting the antibiotic potentiating activity of some AMPs and to combine several anti-biofilm mechanisms in tandem targeting the biofilm formation process at different stages is also discussed.